Today, you’re going to learn a little bit about the quirky-looking (but still perfectly capable) 2016 Jeep Renegade in Keene, NH. After all, it’s not everyday a little vehicle like this rolls onto the scene, and takes the market by storm. With vibrant colors plastered on a unique and fun design, this Jeep is the last thing you’d expect to be off-road capable, let alone have best-in-class 4×4 capability. But, the Renegade Trailhawk trim does and is the specific model we’ll be exploring today. On top of off-road prowess, it’s also street-smart. What I mean by that is it’s just at home on the city streets and highway as it is in the woods. Thanks to a combination of its stellar all-around powertrain, and small size. A few other honorable mentions – that won’t be covered in this post – are its large amount of safety and technology features, and its unique interior. Tech and safety features, such as JBL sound system, rearview camera, blind-spot monitoring, Uconnect 6.5-NAV with a loaded 6.5-inch touchscreen, and even rear-cross traffic alert are all along for the ride. And the inside of the Renegade is just as fun as the outside, with interior color schemes like Bark Brown/Ski Gray/Tangerine accents, or Black and Ruby Red. Even the Trailhawk trim retains the same quirky shape as all the other trims. But, it’s fun and cute in a way. Clearly, Jeep was trying to breakthrough to a younger crowd, and provide something different for those who don’t like the rugged persona of a Jeep, but still want the capability or Jeep experience. Personally, I think it was a smart move on their part. 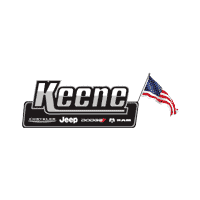 The sales are doing very well, and everyone from college students to established career veterans alike love the fun vibe this Jeep gives off, especially since the starting MSRP is just under $20,000, which is a very affordable price for everyone. While the Trailhawk costs more thanks to the additional off-road gear – like tow hooks and more rugged tires – it still comes in at $26,745 for a starting MSRP. Not only is that cheaper than most new cars on the 2016 market (the average price hovering around $32,000) but it’s also the top-of-the-line trim, meaning it’s not only loaded down with off-roading gear, but all the great technology, entertainment, and safety features as well. But, enough of this banter. On to the actual design! The iconic vertical seven-slot grille is probably the first thing you’ll recognize on this Jeep, and it’s set between the familiar round headlights that most Jeeps have. The overall shape is more reminiscent of a bite-size cube of cheese rather than the stocky and boxy design of there Wrangler, Compass, Patriot, and even the Grand Cherokee. 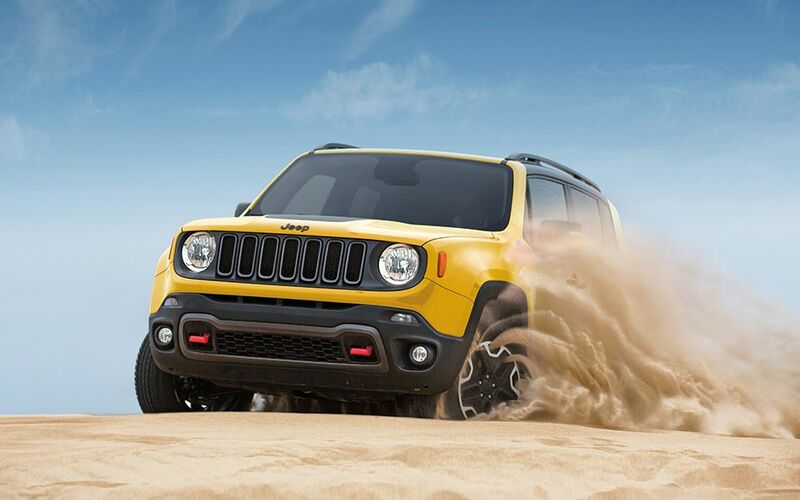 The Renegade shares the definitive windshield of its Jeep siblings, which steeply cuts down to the hood at less than a 45-degree angle. 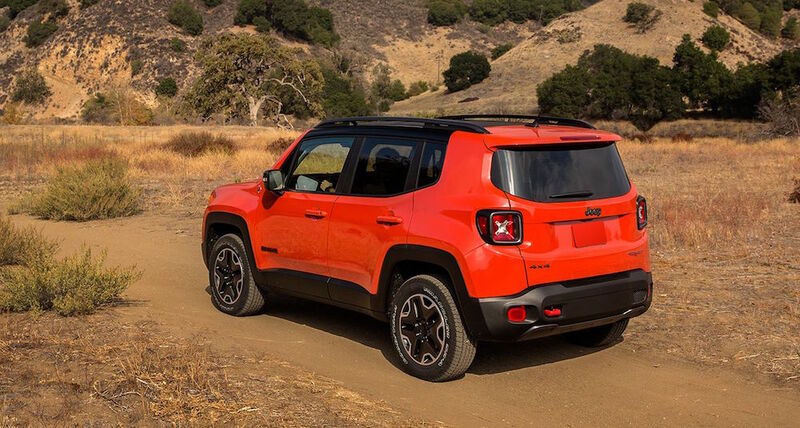 Roof racks sit atop the roof, while X-shaped taillights dominate the attention on the back of the Renegade. Vibrant colors like Colorado Red, Omaha Orange, and Solar Yellow are available for the paint. If you want something that doesn’t make you stick out like a sore thumb, there are more subdued options like Jetset Blue, Granite Crystal Metallic, Anvil, and Black. However, the Trailhawk does set itself apart from its brethren thanks to a few design tweaks. Like the hood, where the raised centerpiece is colored black on the top (regardless of whatever color paint is chosen), along with the bright red tow-hooks that stick out from the front bumper. Don’t worry, they’re secured directly to the frame. That way, when you try and pull your buddy out of the mud, you won’t rip your front-end off. Typically, Jeeps are known for having absolutely amazing off-road capability, but not being so great on the road. While that reputation has changed slightly thanks to modern engineering – even Wrangler and Cherokee off-road oriented trims are adequate on-road performers in 2016 – the only Jeep I’d call street smart is the Renegade Trailhawk. The standard engine on the Renegade Trailhawk is the larger 2.4-liter four-cylinder, which produces 180 horsepower and 175 lb-ft of torque. 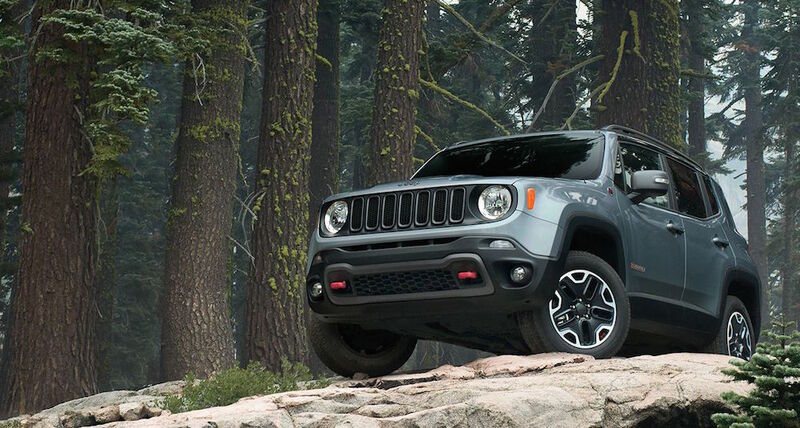 Now, I know what you’re thinking – and it’s probably something along the lines of “pfft, wimpy.” But, you need to remember just how tiny the Renegade is compared to the Wrangler. Anymore horsepower would be overkill, and the Renegade Trailhawk would lose its surprisingly good fuel economy. This engine is paired to a nine-speed automatic transmission, and the Trailhawk is exclusively a 4WD model. But, that doesn’t stop it from being a great on-road vehicle. The four-wheel drive powertrain on the Trailhawk earns 21 mpg city and 29 mpg highway. While most rivals provide slightly better fuel economy, the reason it’s so good is because this 24 mpg combine comes with a side of best-in-class off-road capability. That’s still more than larger SUVs and sedan get. So, why not take this for a spin, instead? Not to mention, its smaller cube-shaped size makes it perfect for those who live in the city but want to adventure in the woods on the weekends. While the horsepower, torque, and transmission have a lot to do with the off-road capability of the Renegade Trailhawk, those aren’t what land it the best-in-class off-road capability rating. The Trail Rated capability actually comes from the 4×4 systems available, which both feature a rear axle disconnect system. 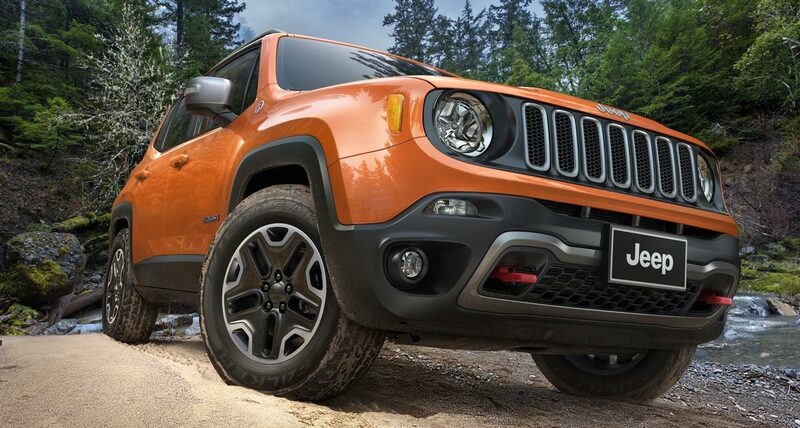 This helps the Renegade seamlessly transition between two-wheel and four-wheel drive. This reduces the energy loss, and increases efficiency when 4×4 capability isn’t needed. It also enhances the traction and handling when 4×4 is activated. In particular, it’s the Active Drive Low system that’s found on the Trailhawk, which is what earns it the Trail Rated badge, allowing the Renegade Trailhawk to dominate the Rubicon Trail. Naturally, this gives it some major bragging rights as far as off-roading goes. Like I hinted at earlier, there’s more to the Renegade lineup than just the funky design and astounding off-road capability. The safety and technology features are also quite impressive, especially when you think of where Jeeps were even just ten or twenty years ago. Combine this with the Renegade’s comparably low MSRP, and you have a vehicle that provides awesome value.